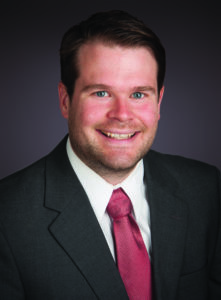 Jake Fischer of Swier Law Firm has been selected to the 2017 South Dakota “Rising Stars” list. 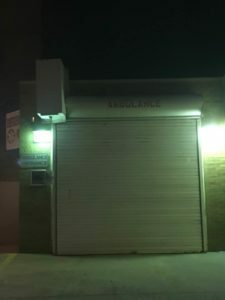 As construction is in full swing at the Winner Regional Healthcare Center there will be a change to the ambulance bay. Kathie Cole, long time EMT and ambulance driver, commented on pulling into that ambulance bay. There is now a new ambulance entrance that will be used during the construction of the new addition to the healthcare center. 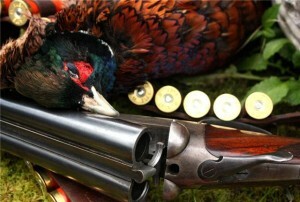 Several guns were taken from vehicles in Winner on the opening weekend of pheasant hunting season. The Winner Police Department reports shot guns and rifles were taken from vehicles. The suspects are believed to be juveniles. The police department is actively continuing its investigation into this case. It is believed all the guns have been recovered. The police department reminds persons to lock their vehicles and also to not leave guns inside a vehicle but take them inside. Also, early Sunday morning the new Runnings in Winner was broken into. Items were taken from the store. The police department is continuing its investigation into this break-in. Glen Hollenbeck of Clearfield won the 68 and over category championship in tie down calf roping at the national senior pro rodeo finals in Panguitch, Utah. 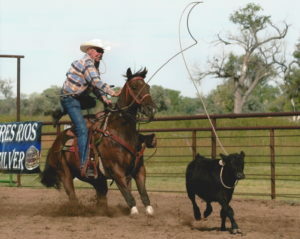 Hollenbeck, 75, had both knees replaced and has worked hard to get in shape and continue his passion for roping calves. Hollenbeck has been a long time competitor in the senior tie down division. Hollenbeck was awarded a gold buckle for winning the title. Winner High School dance team placed third overall at the state Class A contest in Rapid City on Friday. In individual categories, Winner hip hop placed second while pom and kick earned third place. “During the season as our individual category scores kept improving we discussed the possibility of placing at state if we did our best and we did,” said coach Cyndy DeMers. “We performed well and the competition was close,” she said. “This is a difficult sport and judged on choreography difficulty as well as performance, endurance and proficiency. Improving our skills was something we concentrated on this year. We hosted a team camp, attended a camp at USD and spent many mornings practicing. As a coach I am extremely proud of our placement and improvement over the year,” said DeMers. Team captains Macy Olson- pom; Abby Marts- kick and Gracie Littau-hip hop have led the teams and provided both choreography and direction in all areas of this sport,” sad DeMers. The coach recognized the two seniors Macy Olson and Maddy Hanson for their dedication and leadership. 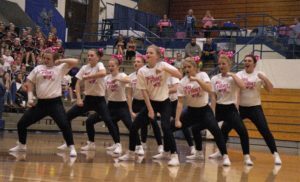 The Warriorette pom team will be performing at the halftime of the second playoff football game on Oct. 26 at Warrior Field. 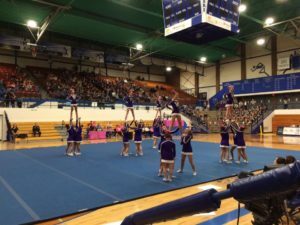 The Winner Area Competitive Cheer team ended their season on Friday, Oct 19 in Rapid City at the State Cheer and Dance Competition. Here are the results and highlights of the last few competitions. Oct. 14th we competed in Platte at the Platte-Geddes Cheer Pink Invitational. The girls all wore Pink Ribbon shirts in order to support all the people in our community that are currently fighting breast cancer. They were especially aiming though to support one of their fellow cheerleaders, Shelby Scott who’s mother is currently fighting this horrible disease. The girls wanted to give Shelby’s mom Kathy a gift to help her along her journey and they presented it at this competition. The girls did not have the best performance but it solidified the changes we needed to make and the parts of our routine that we needed to work on the week of state. Overall I am completely happy with how our season ended. These girls worked super hard to finish the year strong and with bigger and better stunts. We changed things up more than once and there were never any complaints. We have 6 seniors that I am not sure how we are going to replace them. Maddy Hanson has been a competitive cheerleader for 5 years, Macy Olson and Hannah Hanson for 4 years and Macie Ferwerda for 3 years. Their leadership and knowledge really helped us be the team we were this year and next year’s seniors have big shoes to fill. Kaylee Bolton and Elisabeth Duffy were new this year, but both of them jumped right in and did an outstanding job. They both were kind of thrown into things they had little to no experience in, and both did so without complaining. I am super proud of all the girls work ethic and dedication. Some of them had at least 1 other sport they were competing in and they still managed to do a great job. We, as coaches are sad the season is over but are already looking to next year. I want to thank my 2 assistant coaches – Samantha Novotny and Kirstin Livermont for all their help this season. They make coaching a little easier and both have strengths that help make this squad as good as it is. 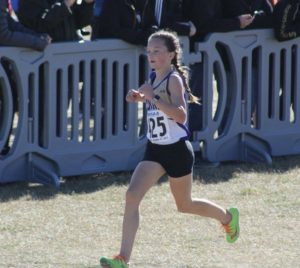 Sidda Schuyler of the Winner Area girls cross country team, took four place in the Class A girls race at the state cross country meet Saturday in Rapid City. Schuyler had a time of 19:32.26. Schuyler’s fourth place is the highest place finish for a girl in Winner High School history. Her place and time qualify her for both Class A all-state and overall all-state. As a team, the Lady Warriors took fifth place. Jaclyn Laprath placed 22nd; Aryn Meiners, 56th Meagan Blare, 57th; Saige Schuyler, 97th and Melanie Brozik, 108th. Coach Jayd Schuyler said this is the first time Winner has had 2 girls on the award stand at the same time, Sidda Schuyler and Laprath. The Winner girls fifth place finish is the highest finish for a Winner girls team in school history. Last year the Winner girls placed 6th and was the first time the girls had placed. In the varsity boys race, Kade Watson placed 15th; Dawson Phillips, 92nd and Wyatt Turnquist, 97th. Watson’s 15th place finish is the first Winner placer since Coleton Schuyler in 2014. “Overall, it was a good day,” said coach Schuyler. Big plays were the key to Winner’s victory in the first round of the playoffs Thursday night in Winner. The Warriors rolled to a 54-0 victory over Stanley County. The game ended at the half due to the mercy rule. Winner will play in the Class 11B quarterfinals which will be Oct. 26 at 6 p.m. in Winner. The Warriors will host Bridgewater/Emery-Ethan. Oct. 19 marked the one-year anniversary of Taylor Watzel’s death. To honor his memory, prior to the game the football team released 66 balloons. Watzel’s jersey number was 66. In Thursday’s first round of the playoffs, the Warriors got off to a fast start scoring 38 points in the first quarter. On the second play, Riley Calhoon scored on a 53 yard run. Midway into the first quarter, Calhoon scored again on a 20 yard run. With 3:46 left in the first, Matt Smither punched the ball in from 9 yards out. Brady Fritz picked up a punt return and ran it in for a 61-yard touchdown. Shortly after Fritz’ score, Shea Connot intercepts a Buffs pass and runs it in for the touchdown. Trevor Peters scored two touchdowns in the second quarter. He scored on a 4 yard run and a 3 yard run. 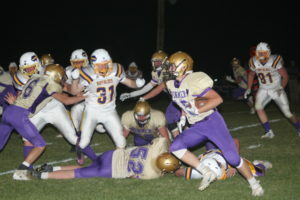 The Warriors had 13 first downs and held Stanley County to five. Winner had a total of 264 yards rushing. The team was led by Calhoon with 96 yards, Peters, 84 yards; Phillip Jorgensen, 27 yards and Zach Lapsley, 21 yards. “We thought going in the start of the game was going to be important,” said coach Dan Aaker. The coach said he was happy with the play of the defense. Leading tacklers were Connot, 7; A. J. Roubideaux, 5; Brandon Volmer, 4; Levi McClanahan, 3. Winner, the two-time Class 11B champion, will have the opportunity to play in front of the home fans on Oct. 26. Aaker says last year in the semifinals, BEE gave Winner one of its best games. They return a lot of athletes from that team. Both teams come into this game on Thursday with a 7-2 record. BEE’s only two losses are to Madison and Sioux Valley. “We will have to have a good week of practice. We will be excited to play them,” said Aaker. Note from Thursday’s game Oct. 19 marked the one-year anniversary of Taylor Watzel’s death. To honor his memory, prior to the game the football team released 66 balloons. Watzel’s jersey number was 66. 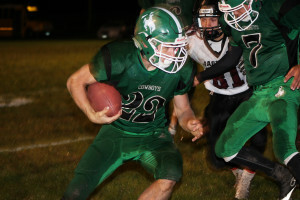 Colome football team defeated Sunshine Bible Academy 60-8 on Thursday in the first round of the football playoffs. The Cowboys will play at Harding County on Thursday, Oct. 26 at 6 p.m. In the game with SBA, Colome scored 24 points in the first quarter. Scoring for Colome were Jackson Kinzer on a 57 yard run, Chase Dufek on a 3 yard run, Layton Thieman threw a 52 yard TD pass to Kolton Salonen. In the second quarter, Jackson Kinzer caught a 19 yard pass from Thieman, Wyatt Cahoy on a 1 yard run, Salonen on a 28 yard pass from Thieman, Calvin Ringing Shield caught a 9 yard pass from Thieman and Kinzer capped the scoring on a 34 yard run. Colome had 313 yards of total offense. Kinzer was the leading rusher with 131 yards, Dufek, 43. In passing, Thieman was 5-7 for 123 yards. Wyatt Cahoy had 5 tackles, Salonen and Cody Assman, 4 each. Winner Lady Warriors volleyball team won three matches in the SESD tournament held in Winner on Saturday. Alexis Richey and Morgan Hammerbeck were named to the all-tournament team. Wagner won the tournament with a victory over Burke/South Central in the finals. In Winner’s first match, they defeated Mt. Vernon/Plankinton 25-17, 25-23. Alexis Richey, Gracie Littau and Daesha Klein were 100 percent in serving. Hammerbeck had 11 kills. Littau had 16 set assists and Mackenzie Levi had 10. Abby Marts and Richey were 100 percent in serve receive. Marts had 21 digs and Richey 18. Hammerbeck had 1 solo block and 1 block assist. Sam Marts had 1 solo block. Winner was 92 percent in serving with 31 kills, 29 assists, 90 percent in serve receive with 77 digs. Winner defeated Chamberlain 25-23, 25-14. Sam Marts, Littau and Richey were all 100 percent in serving. Richey, Littau, Hammerbeck and Daesha Klein had 1 ace. Hammerbeck had 7 kills and Abby Marts, 6. Littau had 17 set assists and Levi, 4. Hammerbeck was 80 percent in serve receive and Richey, 75 percent. Hammerbeck had 8 digs and Richey, Abby Marts and Klein, 6 each. Sam Marts had 1 solo block and 2 block assists. Abby Marts had 1 solo block. Winner was 96 percent in serving with 4 aces, 22 kills, 22 set assists and 39 digs. Winner lost to Wagner in two sets—15-25, 20-25. Littau, Hammerbeck were 100 percent in serving. Hammerbeck had 5 kills and Littau, 4. Littau had 12 assists and Levi 5. Richey was 76 percent in serve receive and Hammerbeck was 73 percent. Richey and Abby Marts had 13 digs. Abby Marts and Ellie Brozik had 1 block assist. As a team, Winner was 88 percent in serving with 18 kills, 17 set assists. The team was 70 percent in serve receive with 51 digs. Winner defeated Platte-Geddes in two sets 25-9 and 25-19. Hammerbeck and Richey were 100 percent in serving. Richey and Hammerbeck had 2 aces and Hammerbeck had 10 kills. Abby Marts added 5 kills. Littau had 15 set assists and Levi, 4. Richey was 100 percent in serve receive and had 20 digs. Abby Marts had 7 digs. Hammerbeck had 1 solo block and Abby Marts had 2 block assists. As a team, Winner was 96 percent in serving with 6 ace serves, 20 kills, 20 assists and 72 digs. In the semifinals, Winner lost to Burke/South Central 14-25, 25-13 and 20-25. Richey and Hammerbeck were 100 percent in serving. Hammerbeck had 2 ace serves and Littau and Levi, 1 each. Hammerbeck had 10 kills and Abby Marts, 4. Littau had 7 set assists. Hammerbeck was 92 percent in serve receive and Richey was 70 percent. Richey had 26 digs and Hammerbeck 16. Abby Marts had 1 solo block and 1 block assist. Sam Marts had 2 block assists and Ellie Brozik, 2 block assists. As a team, the Lady Warriors were 95 percent in serving with 4 ace serves, 22 kills and 77 digs. Winner played Burke/South Central to get into the championship. “They came out attacking the ball which kept us playing defense. We did a great job of playing defense and digging up their hard hits but it kept us out of system. 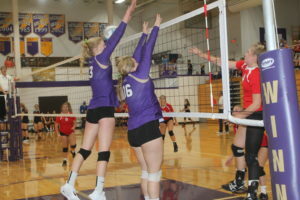 “The second set we came out attacking and kept Burke/South Central on the defensive end. The third set went back and forth. I was proud of the girls and how they played together as a team and never game up. We same some great teams and had great competition. It was a fun day,” said the coach. Earlier in the week, the Lady Warriors were on the road as they played MVP and Wagner. Winner beat MVP in four sets—25-20, 25-21, 28-30, 25-15. Littau and Addy Root were 100 percent in serving. Abby Marts, Klein and Root had 2 ace serves. Marts had 21 kills and Ellie Brozik, 13. Littau had 30 set assists. Richey was 90 percent and Hammerbeck 83 percent in serve receive. Richey had 32 digs and Abby Marts, 23. Littau had 1 solo block and Sam Marts l block and Hammerbeck, 1 block assist. Winner was 94 percent in serving with 10 ace serves, 48 kills, 44 assists, 128 digs. On Oct. 17, the Lady Warriors traveled to Wagner and lost in 3 sets—18-25, 21-25, 22-25. Klein and Littau were 100 percent in serving. Abby Marts had 2 ace serves. Hammerbeck had 9 kills and Abby Marts, 7. Littau had 17 set assists and Levi, 6. Richey had 19 digs and Abby Marts, 16. Marts had 1 solo block and 1 block assist. The Lady Warriors were 92 percent in serving with 6 ace serves, 25 kills, 66 digs. Region play starts on Oct. 30.